The first thing to understand about the Flow Hive is that it’s not a new type of hive it’s a langstroth hive with a built-in extraction tool. The innovation of the flow hive is in its plastic flow-frames that allow honey to drip out the back of the hive when you want to harvest. It is important to realise that the Flow Hive is not a Showtime Rotisserie. You can’t “Set It And Forget It”. Like all hives, the Flow Hive needs regular maintenance and inspections every 7 to 10 days. Inspecting your hives at this frequency will allow you to stay on top of any problems. If you wait longer than two weeks, you’ll risk missing something. For instance, a colony can produce a new queen and swarm in just over two weeks. It’s honeybee behaviour, and there’s no way around it. So it doesn’t matter what style of hive you have, you’ll need to suit up, opening the hive, pull off the honey supers, find the brood, and a inspect each frame every 7 to 10 days. That means that the Flow Hive is just as much work as maintaining any other style of hive. 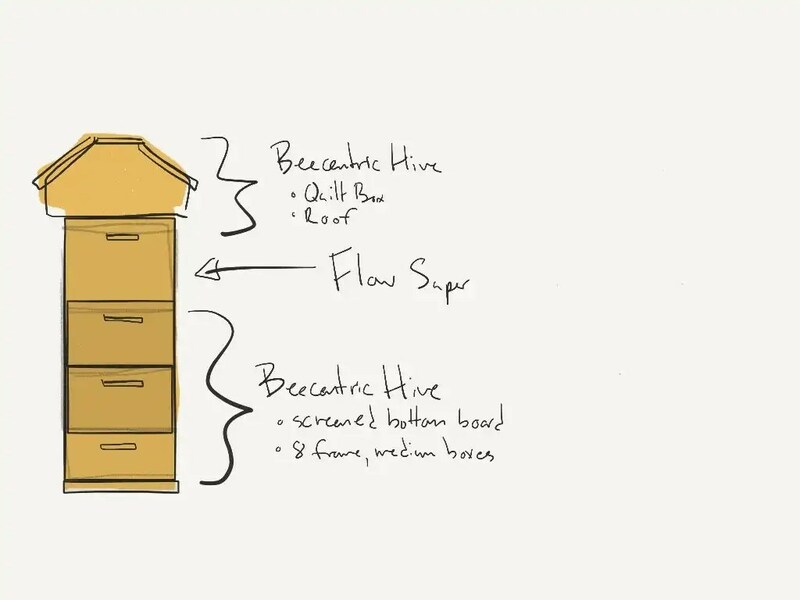 Others have written at length about the pros and cons of the Flow Hive so I won’t go into too much detail. My biggest concern is that new beekeepers will assume that the Flow Hives is a zero maintenance honey machine. It’s not. But it’s also clear that many people have been using Flow Hives successfully. Here are a few things that I would consider when utilising a Flow Hive. As mentioned, the Flow Hive is a Langstroth hive with plastic Flow Frames. Unfortunately, likely because they prefer wax, the bees sometimes ignore plastic Flow Frames. If they decide not to use it, the bees will store honey in their brood chamber, run out of space, and potentially swarm. One local Flow Hive user described hi Flow Hives as a “swarm factory”. Of the three Edmonton Flow Hive users that I’m aware of, two of them have had issues with the bees accepting the plastic Flow Frames. Most of these beekeepers have eventually coaxed the bees into the flow frames with tricks like misting them with sugar water. I can’t think of anything more tragic than excitedly turning the key on your Flow Hive and accidentally crushing a frame of brood. To prevent this, the makers of the Flow Hive recommend using a queen excluder to limit the queen to the brood boxes. Unfortunately, queen excluders aren’t 100% effective, and since they limit the size of the brood can further contribute to swarming. You could probably get around using a queen excluder once the bees start storing honey in the top of the brood box. This would provide a natural honey barrier that the queen wouldn’t likely cross. Also, at least one source told me that queen doesn’t like laying eggs in the deeper Flow Frame cells; this is hopefully the case. Whether to use a queen excluder or not is a controversial topic amongst beekeepers. Full disclosure, I’ve never used them. Bees don’t use them in nature, so I’ve never cared to add them to my hives. I use Beecentric Hives that uses medium-frames for honey and brood. When it starts to get cold, the bees huddle together at the bottom of the hive. As winter progresses, they’ll consume honey upwards until they’ve reached the top of the hive by spring. At this point, the queen will start laying again. However, if this upper box is a Flow Super, the queen will start laying in the plastic Flow Frames. That would be a mess so remove any Flow Supers in the fall. This isn’t a big deal – it’s what conventional beekeepers do all the time – but it kind of defeats the point of spending hundreds of dollars on frames that are supposed to save you work. Since the Flow Hive is an Australian invention only time will give us a sense of how the Flow Frames hold up in colder climates. In the height of summer, hives in Edmonton can reach two or three brood boxes. In contrast, the Flow Hive comes with one brood box. To provide enough room and to prevent swarming, you’d need at least one (and likely two) more. You can purchase additional Flow Hive Supers for around $70 Canadian. To save yourself some money, purchase woodenware that uses the same size of box as the Flow Hive (like the Beecentric Hive). Ironically, extracting honey from a Flow Hive isn’t as straightforward as it looks. For starters, to tell if it’s time to harvest, you’ll have to open the hive and remove the flow frames. Since the whole point of the Flow Hive is to avoid opening the hive up this defeats the Flow Hive’s entire premise. If you don’t check to see if you’re the honey is ready to harvest you’ll risk extracting uncapped honey that will likely ferment on you (uncapped honey is much higher in water). The flow-frames also rely on the caps to direct the honey down the frame. Extracting uncapped honey in a flow-frame is likely to spill into the brood box below. How well the honey will flow from the back of the hive is dependent on the weather. Though the bees do a decent job of maintaining a warm internal temperature, I have been told by local Flow Hive users that they’ve had the most success when the outside temperature is above 24 degrees Celsius. It’s worth noting that it takes about 20 to 25 minutes for the honey to drain from each flow frame. This means a lot of waiting. It also leaves the honey exposed and tends to attract wasps, bees, and other interested parties. At this point, I would be tempted to remove the flow-supers with all the flow-frames and perform the extraction inside the controlled environment of my kitchen. So in the end, the Flow Hive is just as disruptive and isn’t any less work than conventional extraction methods. At a price of nearly a thousand Canadian dollars, it’s probably not less expensive. Once the hive is three boxes high, you should see the bees storing honey in the top-most box. At this point, add the Flow Super to the very top. Perform regular checks to make sure the bees have accepted the plastic foundation and are using it. Continue with regular inspections. When the Flow Frames are filled and capped honey, extract. Reset Flow Frames and repeat as often as possible. Remove the Flow Supers when the honey flow slows down towards the end of the season. Let the bees backfill the remaining three boxes with honey. They will start storing honey at the top. Monitor progress. The goal is to let them fill two boxes with honey for the Winter. They should be able to do this by the time Winter hits but feed them if you think they’re going to run short.